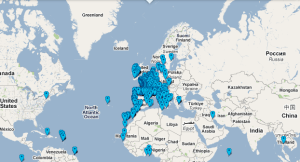 Today all across Europe the Surfrider Cleanups kick off. So get off the couch, turn off your television and go to the beach! It's a great and fun initiative to increase awareness of the extent of pollution and the efforts of eco-citizens. According to the UNO, every kilometre of ocean contains 120 000 pieces of floating plastic; however despite this, macro-waste is still not considered real pollution under European legislation! Check out the Surfrider Cleanup website to check where you can help out.